I recently made a fairly significant addition to my digital camera kit – a Canon EOS 5D. Ever since I’d tested the camera for a few weeks last year I had been dreaming of getting one of my own (and saving my pennies) so when I had enough money saved up I grabbed one. Also rounding out the purchase was a new Flash and a Battery Grip. While I thought long and hard about buying the camera body and the new flash the Battery Grip was something of an impulse buy. I’d previously always invested any spare money into new lenses and hadn’t thought about a battery grip – but there was an option to throw in the grip (and an extra battery) for only a little extra and so I decided to give it a go – thinking that I’d probably only use it if photographing an event like a wedding. Having had the new camera, flash and grip for a six weeks not I can honestly say that I’m extremely pleased with each of the purchases. The 5D is a dream to use. My only complaint is the slower frame rate in burst mode. I’m also loving the ability to go extra wide with my 17-40mm lens now that I have a full frame camera. I’m also starting to wonder if I should buy a lens with a longer range than 200mm (as it has less impact on the full frame sensor than it had on my old 20D). I’m also loving the flash – it’s producing some great results and now I have the ability to set it up in a slave setup with my old flash I’ve been experimenting with some interesting lighting for portraits. So the 5D and the new flash are great – but what has surprised me most is that I am really loving the battery grip. In fact instead of just attaching it to my camera for special events, I’m finding that I’m using it all the time. More Power – two batteries instead of one means recharging half as much. I find that Canon DSLRs have pretty good battery life at the best of times but after a couple of weeks of medium use-age shooting with the 5D I realized that I’d not had to recharge once (a new record for me). It was also great when shooting my son’s birthday party last week. No hunting for and changing batteries at key moments! Weight and Balance – two batteries weigh more than one and the grip itself adds a little weight and size to the camera. While this could be seen as a disadvantage (and I’m sure it would be in some circumstances) I really love it. I feel like the camera is sitting well in my hand and that I’m somehow more solid when taking shots. I’ve read people argue about battery grips helping combat camera shake and previously didn’t see how something heavier in a hand would help – but again I ‘feel’ like there might be some truth to the argument. The only real downside of the battery grip is that while the extra weight and size feels good, it could get a little tiring – quite literally. I did shoot with my 70-200mm f/2.8 IS lens for a few hours last week. It’s not a light lens and with the extra weight of the 5D (as compared to the smaller and lighter 20D) plus the weight and size of the battery grip I did feel like I was lugging around something pretty significant. 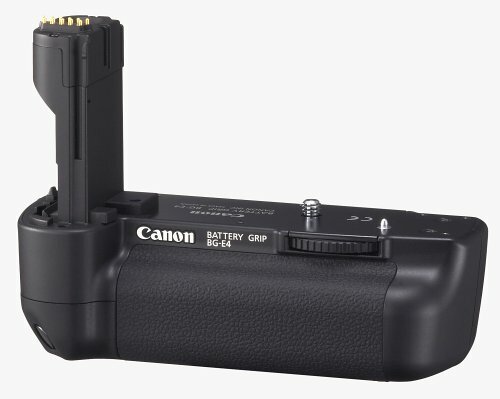 Do you use (or have you used) a battery grip for your DSLR? What benefits did you notice? What didn’t you like about it? Would you recommend one? I have a 600D and just got a battery grip for it today. The difference ergonomics wise is as evident as night and day. I take a lot of "sideways" shots (buildings) and the second shutter button and aperture control is just fantastic. Not to mention it adds a lot of bulk which makes the camera feel better overall. Just came across this thread. I've been wondering how come despite the added weight it feels like there's way less camera shake with the grip on! The battery grip on my 60D is marvellous. I agree with the above reasons, but extra to those, I'd say the most valuable aspect is comfort. Shooting in portrait is not only easier, it's less tiring. I don't have to angle my arm up at the shoulder anymore. This not only helps with balance, but also fatigue. I'm buying one for my 5D asap. As far as the weight of carrying extra (believe me, I know this one... I carry both around, with a bag of lenses, pretty much all the time) - I just got one of the Black Rapid RS DR-2 twin harnesses, and what a difference it makes. Neck straps have been removed, and now all extra lenses stay in a Lowepro backpack, not a standard Canon shoulder bag. So, all weight is off my neck, and spread across shoulders and torso. People who don't carry that kind of gear around might look at it as gear-whoring, just another fancy doodad to show off, but anyone who does carry that kind of weight around knows how important it is to have a system that is comfortable. We're in it to enjoy ourselves, so why wander around tired and sore? I bought one thinking it just made sense but ended up taking it off because I didn't need the battery life and the size made me feel like I was trying to look like a big deal. I've only had it a few weeks and was thinking about returning it but there are some great points made here. I prefer to be as stealth as possible but I'll have to take it out again and reconsider these ideas. I have a D700 and a D90. both of them have battery grips, and I don't think I have taken them of except the D700 to change the camera battery. I find that battery grips help me stabilize my camera. I also do a lot of portrait photography and the shutter release and controls on the grips are invaluable in this situation. I am using the 1Ds Mk III which has a sort of built in battery grip which I find excellent, I also have a 5D body as a second back, I am a bird photographer and find I drag so much equipment around that already feels heavy, the 1Ds Mk III with a 400mm and 1.4x converter and I am now also carrying a second camera the 5D with a 300mm zoom, - feeling already like a pack-horse I am loathed to put the battery grip on the 5D, it is just easier and lighter to drop in a new battery from my pocket. I got a free battery grip with the 5D when I bought it and I’ve never used it! – But having said that – the 1Ds Mk III design with the built in battery grip is my favourite and I wouldn’t be without it. I never leave home without it...have one for both my 20D and 50D. Improves the balance I feel in my hands. I recently bought an Opteka Professional Battery Grip for Canon XS/XSI/450D/1000D DSLR's. I use it on my Canon T1-i (500D). It came with 2 1500 ma batteries. I looked at the Canon grip and decided on this one for one reason - the total cost was less than $70.00 (new) from Amazon. I happen to love it. The case matches the T1-i perfectly and although it adds weight and bulk, I find holding and shooting much more comfortable. These batteries last incredibly long. It works well with the tripod and remote shutter cable. I found that the original battery did not last long enough for use with the remote shutter cable. Now there is no problem. I have a grip in my 1000D and it works really great. The grip is fixed to the body all the time. Never removed it! Part of it is the weight it adds on the body and fits my palms perfectly. I want to like my battery grip but find it uncomfortable to hold and could never quite get used to it. I bought one three years ago used it a few times and then tossed it in my bag. I pull it out every so often as a curiosity but never end up using it. If Canon or Nikon could make a battery grip more comfortable matching the contours of the primary grip I'd use it more often. when i bought the battery grip for my 500D (same for the 450D) i knew i needed it. primarily, my purpose is for flexibility in power supply aside from the other benefits (and disadvantages) it provides. the grip allows you to use 2 battery packs. meaning twice the portable power supply vs no grip. being able to use penlight AA batteries as another advantage since i bring plenty of recharged AA's which i also use for other devices (portable speakers, flashlight, etc) when traveling. the extra buttons on the grip are very useful when taking when taking pictures at the 'portrait' position. the grip also seem to give my very light 500D better balance and stability specially when using long lenses. my main problem is when i take it out and shift back to a single battery i don't seem to have a place for it in my bag. the protruding part that fits into the battery slot makes it an object difficult to tuck in a small and semi-full storage space. i don't like lugging a bigger bag than what i have now which allows me to bring along 2 extra lenses and some small objects (memcards, extra AA's and a small tripod). I found that the battery grip only for some DSLR camera as EOS 5D 20D 30D. I dont know what is the battery box? If i should buy a DSLR camera has the battery grip, maybe it can work for longer as the normal camera. I too am debating about a battery grip for my new 450D. After having a battery die on me in my little SD630 a few years back while I was on vacation in Venice, I am now paranoid about losing shots... stupid me should have bought a backup or my S3 IS that day. The cheaper knockoff I saw on EBay looks OK, but I'd prefer to have an official Canon one (plus I imagine the extra controls are nice to have). The only thing is that I only occasionally do much in the way of vertical composition, wondering if it will be as useful to me as others. I have a 400D, and i have been playing round with a friends battery grip. It definitely improves the balance with a large, and makes it look much cooler (baby 1d anyone? :P) but on a day to day basis, does it make the 400D a lot more annoying to use, in terms of putting it in your bag and things like that, and does it really make that much of an improvement? I bought my Canon battery grip together with my Rebel Xti. I loved it since I took it off the box. I loved it even more when it was attached to my xti. It's a perfect match. Without it, the xti feels like it has something big lacking. With the grip, you have more power, more balance, and more professional looking. One other thing, go Canon original and you won't go wrong. It's definitely worth every penny. Ive had a Canon Rebel XTi[stock kit 18-55mm] for 2 days, much MUCH heavier than the Kodak [Z7590+.7X wide angle] im used to. But ive found that the camera stap, if you make it about as short as it goes, then you can winde it in a number of ways around your wrist/s and transfer the weight from the hand to the wrist/s. I can stablise the cam, and get far less weight direct through my hands and transfer it to the wrists and my arms sometimes, im taking shots a number of stops lower than normal. A solution with NO weight or Â£$ probs either. Give it a shot first. I have an update from my earlier post. I found an IR battery grip on ebay for my d50. I've had it for two days and its been great. I have to put the camera in IR Remote mode, but its nice to be able to hold the camera verticle and fire the shutter without having to reach over the camera. I tried it in bright sunlight and the IR signal is interfered with by the sunlight but given the other options this is great. We have two cameras the 300D and the 350D a battery grip is the first thing we purchased after buying the camera as we shoot a lot of sports photos it was a must for us we can go the whole day without the camera dying due to flat batteries. My husband bought one for my 20D for me and at first I didn't like it because I felt like it made the camera too big, both for comfort and because I didn't want to stand out so much. I took it with me on a trip to Cambodia, where my camera's shutter button promptly died. I was so happy to have the spare shutter button so I didn't miss anything. It hasn't come off since. I have the BG-E3 and I leave it mounted now all the time. I'm a fan. I bought one for my 350d and it is very rarely off it. The other added advantage is that you have an emergency back-up for batteries with the AA holder. Rarely used, but useful when traveling. 5D is a dream to use. If you get this camera with 85L 1.2 MK II is a brilliant combination. In answer to John's question, I find that with the grip on my 350D I suffer NO impairment switching from landscape to portrait WITHOUT switching to the battery grip, if speed is of the essence. After a couple of shots though, my hands always seem to have (mysteriously) moved to the grip - but at least it's easy to then move back to landscape mode. Boy have I ever been debating this one. I had the original Rebel, a 20D, and recently a 5D, and I purchased a battery grip with every one. On the rebel, I did it so people would think I knew what I was doing. (Yeah, I'm shallow that way.) On the 20D, I never take it off - it just feels right. So I put in on the 5D as well, now that I shoot professionally (meaning I get paid to take pictures). Now when I show up at an event/assignment, people all think I know what I'm doing (ha! - little do they know...) and I started wondering what life would be like if I took off the battery grip. I should mention that I don't like camera straps - I like the hand grip ( a padded strap that runs form the top right of the camera to the bottom along the right side - so your shutter-side hand is secure holding the camera. I have Canon's which only works with the battery grip, and a Tamron one that works when you don't have the grip. But switching between grip/no grip is a HASSLE (because of the strap - no other reason). Having the battery grip on means I have to take that into consideration when buying accessories like camera bags. Most bags are made for standard DSLR bodies. With the BG on, the camera has the same profile as a 1DS, etc. so when buying a bag you have to look for: "fits 1 pro DSLR...". When shooting professionally, I like the grip. When shooting street or walkabout, I prefer the sleeker profile without the BG. SInce I get paid for the work I do with it on, I don't take it off. So I shoot less personal work, which is less satisfying. What should I do? Get over the handgrip and learn to love straps? I just don't know. The easy answer would be buy another 5D. Anybody seen a stack of hundreds lying around? I use a 350D, and the battery grip came "free" with the kit I bought. At first I thought it was an odd thing to include and saw very little point in it, but after 18 months of shooting without it (albeit having a spare battery), I suddently felt the urge to use it when doing some portrait work of a friend's baby. Since then, I haven't taken it off!!! I agree with the comments about ease of use, balance, and with my 70-300 IS USM, I find it counter-balances beautifully. Oddly, I tend to only use one battery in it though. I know this may sound strange, but I prefer the safe knowledge of having a fall back battery - maybe I should buy a 3rd battery! How odd then, that it's called a battery grip! Maybe it should be called a portra-grip, or a balancer-grip. I had a battery grip on my 10D and became completely addicted to it. When I upgraded to the 5D I had no choice but to purchase one and, despite the price tag, I couldn't be happier. You may like to try out the Canon EF 100-400 f/4.5-5.6L IS. It's not cheap, but it's a gorgeous, high-performance lens. I thoroughly adore it. Broken wrist, cannot hold the camera in portrait orientation without the battery grip. I don't have the vertical grip for my D200. When I've tried them out in the camera store, it didn't seem like a good fit like the one on the camera itself. Extra weight seemed to be a factor as well. One question I have for users that do have them; how, if at all, does a battery grip impact your ability to react? For example, say I'm shooting an event where I'm holding the camera in a horizontal position. I quickly notice a shot I want to get, look through the lens and decide vertical is better. Today, I don't have to worry about changing my grip on the camera - I simply show everyone my armpit and take the shot ;). Do you do the same, even with the grip installed, or do you take the time to change your grip on the camera to use the shutter button on the battery grip. And if so, how smooth is that transition? I too thought that the battery grip would come way after I got more lenses. However I also bought one on impulse. After I spent 4 days at the Grand Canyon, I was really happy I got it. The grip makes it a lot easier to carry all day. Also, I find it difficult to zoom and manually focus the 70-200 while trying to hold the camera steady with my hand over my forehead for fast portrait shots. So the grip is great there. Only problem I have is getting oriented to where the eyecup is in relation to were the shutter release is. The portrait vs landscape difference in eye-hand position is significant for me. Its not quite "natural" with me yet. I do require conscious adjustments when changing positions. I purchased an extra battery and battery grip for my D200 a few months ago. I noticed that the D2 drained the batteries way faster than my D70 so I decided to up the ante and do battery and grip at the same time. I love it! I can shot for a much longer stretch of time and I love to solid feel of having the extra weight to stabilize my shotsâ€¦I never take it off the camera. And yes it does grab more folkâ€™s attention when you pull one of these out. It looks more professional. My husband cracks up because- I am a girly-girly and inevitably heads whip around when they see me coming at them with one of these. I have a battery grip for my XTi. It's the knockoff Opteka brand. I love it, though. It has a magazine to hold 6AA batteries instead of 2 of the camera-specific batteries. Said magazine in my grip is loaded with 6 2500 mAh NiMh rechargable batteries. This provides more power longer than even the Sterlingtek battery copies can provide. I also find that my XTi's size including the grip is perfect, absolutely perfect for my hands. I have had the BG-E2 battery grip on my beloved 20d for some time now. What a brilliant addition! I deliberated for some time as to the validity of it, but now that I have one and have used it for a while, I couldnt get another camera without a second shutter. I also got myself the handgrip which I can thoroughly recommend if you are thinking about getting one. If you are like me and despise having your camera around your neck, then the handgrip is the perfect solution. I used to wrap the neck-strap around my wrist and it annoyed me an incredible amount. It's relatively inexpensive too and makes shooting a real pleasure. It's incredibly comfortable. Anyway... back to the battery grip. What's not to like?? Double the battery life which speaks for itself. Secondly, with the second shutter release, it means you don't need to do wrist gymnastics to take a portrait. If you are switching between portrait and landscape for long periods of time, I have found my wrists hurt considerably less at the end of that day. Hand grip also helps with this as you aren't gripping the camera for dear life in the fear of dropping 'the precious' (said with Golem-like voice). Lastly, I honestly feel that it balances out the camera a lot better. Maybe I have just gotten used to having it there, but I tried without the grip recently and felt that it just didn't balance properly. There is of course the credibility factor too. It does make you look a tad more like you know what you are doing, even if you don't! I have been lucky enough to travel quite a bit and I see tourists who are using point and shoot compact cameras get constantly knocked back by locals when asked if they can have their photo taken. I can say that I get very few knock backs. Maybe it's my dazzling personality shining through (hmmm) or maybe it's just because my kit looks so professional aided by the battery grip that a subject feels more at ease that it might be for 'something special' or confident that a good pic will be taken. I get asked a lot if I am shooting for a book or a magazine. If it helps me get a shot, I say "yeah... just doing a little piece for National Geo" or similar and you might be surprised how open people are to be involved. A bit naughty I guess, but these are things we do to get THAT magic shot. All in all, I couldnt recommend a battery grip enough. I used a friends 450 the other day instead of the 1D I normally use, and the absence of the second shutter release and dial was very obvious, and they also give you more to hold onto, which is useful if you are trying candid shots. I'd always try to carry a spare Ni-cad around with me, just in case. However, bear in mind the extra weight if you have a small tripod. When I purchased my 2nd hand DSLR, I got a battery grip + extra batteries with it for free. I never used it. WHY?! would you say? First of all, I can easily shoot a 4 gig card, all raw, (+- 800pics) with one simple battery. I chose my camera (d70s) partially because it lies so smooth in my hands. The battery grip totally negates all ergonomical advantages this camera has. I purchased one for my Nikon D80, I didn't intend on buying one when walking in to a camera store, but I requested to play with one and ended up buying it, besides the advantages mentioned by other users, one of the advantages is that when I wear have my camera around my neck with my 300MM lens attached, prior to buying the grip, the weight of the lens would make the camera lean forward, making it inconvenient, but with the extra lenght that the grips gives my d80, this is no longer a problem, and by the way, I find myself using it all the time. I have the MB-D80 for, of course, my D80. I agree with all of the reasons that you and the readers have stated. They should be compelling enough to "get a grip for oneself" (pun intended). The only downside I have experienced is my own fault. The MB-D80 has a switch surrounding the shutter release to lock it off. If I don't remember to lock it when I return to landscape orientation, I find that sometimes I can't make settings adjustments (like ISO). The reason is my hand partly depresses the MB-D80 shutter release without me sensing it. This caused me a great deal of frustration until I found out what was going on. Now, I twig into my self-created problem and remedy it tout de suite. By the way, greetings from the depths of Canada. I love my BG-E2 on my 20D - hand positioning, weight, balance, the way people give you automatic credibility as a photographer :D The grip stays on my camera most of the time, even if the size/weight is an issue I just think I'm getting a workout with it on! - on a 20D I loved selecting the autofocus point with the multi-direction joystick - however, when using a vert grip you can't reach that joystick with your thumb anymore. - the added size of the body will not allow the camera to fit into some bags and is a bit daunting if you just want to trek around the city with a 50mm prime and the body - so, sometimes just too bulky. I'd definitely recommend one if you've got the cash lying around - otherwise I say save those pennies for some amazing lenses! used a battery grip on my old 350d since the second week. don't have one on my 30d and for the moment prefer it that way. the 350d was so much smaller and the battery grip balanced things out. the 30d feels much better in my hands and a grip's not necessary. i'm sure i'll get one sometime though. The MB-D200 is the second battery grip I have gotten for a camera, the first was for my Nikon 5700. I ordered the battery grip the same day I got the D200 knowing that I wanted the additional battery and and portrait shooting options. I loved using the 5700 grip and I love using this one as well. There is the added weight, as has been said, but it really does add to the overall balance of the camera and lens. I mostly shoot with a 70-200mm 2.8 for extended periods of time and have found the added weight is no longer an issue now that I have become use to the configuration. My battery grip stays on all the time and the only negative aspect to it is when I don't (or forget to) lock the shutter release on the grip and accidentally bump it while carrying or positioning the camera. I will admit... I do like the additional professional appearance the grip gives to the camera as well... but that is only a tiny reason I leave it on. I bought the Nikon MB-D200 for my D200 and I really love it. All the reasons cited above are valid. I like the extra battery power and the additional weight and balance that it provides. Also, however, I like a additional shutter release and control set for vertical shooting. If you flip the camera 90 degrees to shoot vertical, your controls are still upper right -- exactly where they always are. I've got a battery grip with my 350D. I purchased the grip with camera and it hasn't come off since I bought it. I love the extra controls on the bottom, the added weight, and the fact that it does make the camera a little more professional. I just ordered the D80 this week. I got myself a battery grip for my D80 and yes, it is great for longer lenses. In general the handling is much better with bigger hands (like mine) and you really get used to it quickly in a good way. Recently i took it off for the first time and the d80 feels and looks tiny and ridiculous. The only thing that bums me out about mine is that although it does have a shutter release, it doesn't have the joystick that my 30D has -- and I find that I can't live without it, so I often don't use my grip anymore. I guess I'm the only dissenter in the bunch. Maybe if I had a Mark III or something where it's integrated? Just FYI . . . I've read in a couple of places that modern rechargeable batteries will last longer if you recharge them regularly instead of waiting for them to get low first (pretty much the opposite of how the old NiCads worked). So while I'm all for using a battery grip to extend a day's shooting, I wouldn't wait weeks in between charges just because you can. Big thumbs up here for battery grips - have them for the 350 and also the 5. Agree with all the benefits, especially weight and balance for the 350 (which now feels very small and plasticky compared to the 5D). I used to use my battery grip on my Canon EOS 350D, but I recently removed it from my standard setup. After getting more lenses and a flash, I ran out of space in my camera bag. My favourite lens, the Canon 17-55mm F/2.8 IS USM, also adds some weight and gives me plenty of room to place my hands, so I also feel I need the grip a bit less. I've had one on my XT for three weeks now, and what a difference! I'm not small (6' 3") so the relatively small XT used to get uncomfortable in big hands after 20 minutes or so. Adding a grip makes it far easier to hold and control well. I bought the Opteka version of the battery grip (same mold and specs as the Canon version, $50 cheaper!) and even had 2 extra batteries thrown in for a total of $80. In all... I love it - the additional comfort and the vertical shooting controls - you just can't go wrong. I haven't actually used a battery grip but would like to get one for my d50. does anyone know where i can find one with the second shutter release? I like to shoot sports in portrait and this would be really nice with my 70-300mm lens. Need to get a DSLR first!!! I haven't used the battery grip, though I considered adding it to my camera. I think the vertical grip argument makes perfect sense. But on the extra battery power, I'd go back to the argument someone recently made on why zoom lenses make people think less about their exposures. Even with two batteries you will run out at some point, it's just good habit to be aware of your equipment and manage it well, including battery charge. I think the only advantage is if two fully charged batteries can get you through an entire session that otherwise wouldn't be possible. But then in most cases the capacity of your CF card runs out long before your battery runs out, unless you have the wireless attachment. I shoot about 80% vertical. I find the grips to be very valuable in hand holding the camera properly. Mostly I only use one battery to reduce weight, but in all day events or weddings I'll use two. It's the ability to shoot veridically that is most important to me. With the Rebel XT/XTi I also find it easier to hold the smaller body. On the 30D and 5D it also gives you a more professional appearance. I shoot plenty of football games - the action is non-stop and the photos ops are continual, so a battery grip allows me to shoot one game after another w/o battery issues. Also, the added weight helps to balance the weight of heavier lenses. I'm not happy with the battery life of the flash. I hadn't given it any thought until I started shooting basketball games. Most of the shots end up being vertical and it can actually be painful to hold the camera like that for extended periods of time. I don't want to spend my own money on it though, maybe I can get the school to spring for the MB-D200. I also found it more advantageous on my 350D than I do on my 30D. But still, when shooting long, all-day events (like a wedding), the battery grip rocks my world. I would *not* use it with a tripod, however, as it adds a bit of instability (it's not the most secure of connections). I bought a batterygrip for my 400d when i was traveling. without it, my pinky would wrap uncomfortably around the bottom where the battery door is, i auctually completly wore off the rubberized finish on that part of the camera in under one month. also when traveling the battery grip for the 400d allows you to use AA batteries as a backup which i found very helpful in places where power would not be readily availble. I have a 400D and I absolutely love my battery grip. The camera now feels naked without it. To note, I also bought the cheap knock off version, a $70 Opteka BP-XT Battery Grip. It works just fine 99% of the time, but has malfunctioned a few times where it overrides the adjustment dial on the camera body until you use it's dial or shutter button for some reason. I wouldn't recommend getting the even cheaper version that is available, so make sure it has the buttons for AE lock, AF point selector, aperture value, shutter, and dial. I have constantly used battery grips on all my cameras (analog and digital) for around 6 years now. It's the first accessory I'd buy for a new camera. Without the grip, I find that a larger percentage of photos come out in landscape format (simply because it is the "default" way to hold the camera) even though portrait would fit better. I have a battery grip for my 5D. I have found that I use it very little. Perhaps as time goes on I will use it more, however much of my work is in the field and with several lenses, flash, etc. to carry, I find the larger size and weight to be inconvenient. So it sits on my desk as a reminder of an investment that is not used. I use a 350D and I find it really tiny - good thing I have a battery grip. It gives me all the advantages you mentioned, but because the 350D is so light to begin with, it doesn't weigh me down too much.